The pathway to a high-paying job in aviation is becoming a lot more navigable, thanks to a partnership between Middle Georgia State University’s (MGA) School of Aviation and Delta Air Lines. Delta’s partnership with MGA – one of only 45 schools nationwide that were selected to participate – is designed to help the University better prepare students to meet an industry need for qualified and well-trained aviation maintenance technicians. MGA’s School of Aviation offers both certificates and degrees in aviation maintenance technology (AMT). After completing their time in both the classroom and the hangar, with hands-on training with MGA’s fleet of fixed-wing aircraft and helicopters, many students go on to take FAA exams for airframe and powerplant ratings, enabling them to take jobs maintaining aircraft for commercial, private, and governmental organizations. Graduates of the program will soon find themselves in an enviable position – holding a sought-after skill set in a high-paying field. As members of the current aviation maintenance workforce reach retirement age, graduates with the necessary skills and certifications will find jobs paying in the neighborhood of $30 per hour as companies and government entities work to keep their planes and helicopters airworthy. 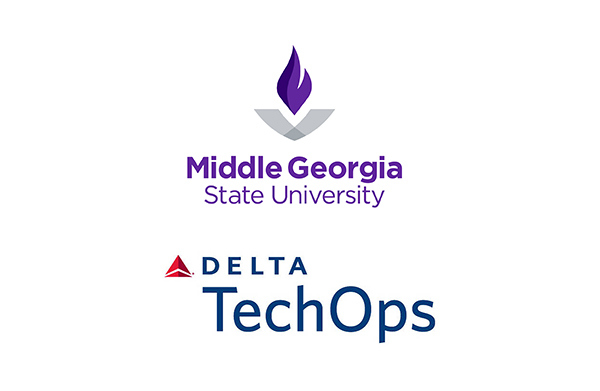 Through the partnership with Delta Air Lines, MGA’s AMT students will be exposed to digital training tools identical to those used by Delta in training new employees. The airline will also be providing the University with decertified airliner parts – parts deemed no longer fit to fly – so students can have access to and experience with working with the same parts and tools that Delta mechanics use at the company’s TechOps facility in Atlanta or at any airline repair facility in the world. “When an MGA graduate applies for a job with Delta Air Lines, or one of its regional partners, the company will know they’re looking at a highly qualified applicant with a robust skill set,” said Kehayes. Prospective students interested in studying aviation maintenance and structural technology at MGA should contact Martin Kehayes at 478.279.6165 or martin.kehayes@mga.edu or visit www.mga.edu/aviation for additional details. Read more details about the Delta-MGA partnership at www.mga.edu/DeltaTechOps. The School of Aviation at Middle Georgia State University is an FAA Part 147 School.